Queen bed studio cabin, clean and comfy! Cute and cozy cabin. Just right for one or two! Kick back or dine out on your private deck. Kitchen area is well maintained and made to move about! Trinidad Pier with a great breakfast and seafood dinner spot right at the ocean! 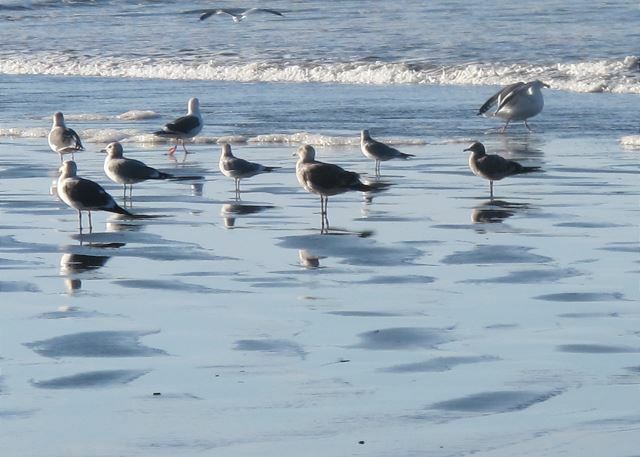 Beaches are teeming with many varieties of bird life! Prairie Creek Redwood State park 25 minute drive north. Hiking and wildlife! View of ocean from a trail at Patricks Point State Park! Trinidad State Beach at low tide! Strawberry Creek is a perfect little studio cottage just minutes from the ocean. 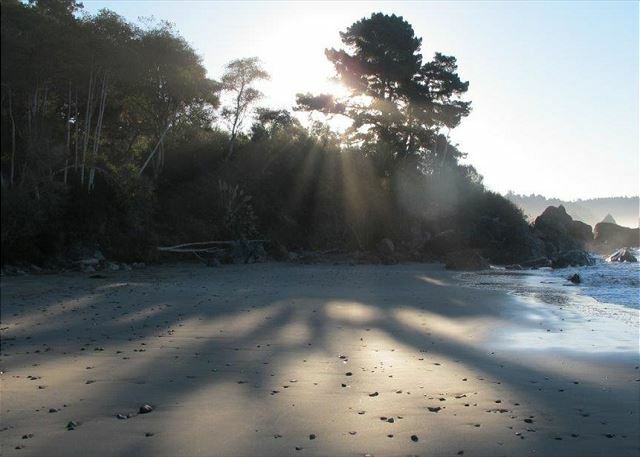 Perfect for a couples getaway to the Redwood Coast!! Relax and Enjoy the ocean air at Strawberry Creek Retreat & 20 yards to he Clam Beach Tavern, with live music & people having fun! 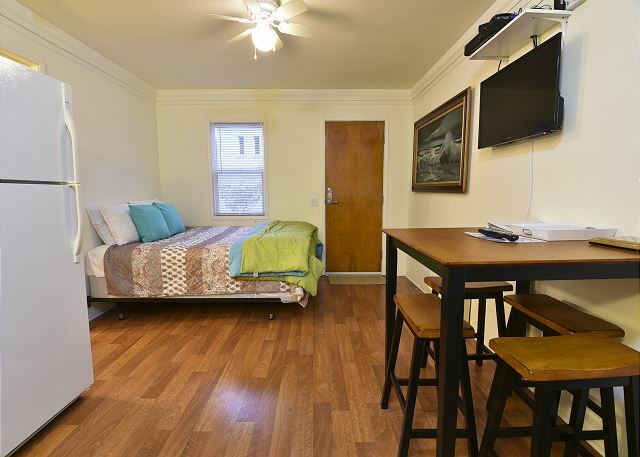 This is an open Studio with a queen bed, full kitchen, and dining for two. Welcoming spacious back deck with seating and table. Just remodeled - walk to the wonderful Clam Beach with it's miles of rolling dunes, beach, ocean, and follow the strawberry creek along the little wildlife sanctum it creates. 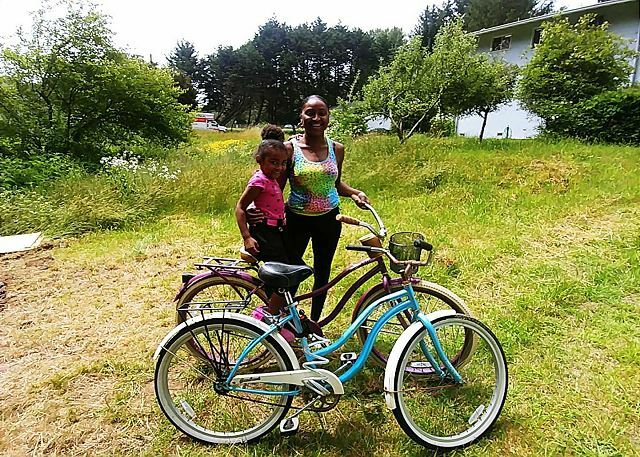 Bring your bikes, or rent them nearby, and right the fantastic coastline including the Hammond Trail, which extends from Clam Beach to Arcata through the bottoms and along the Mad River. One dog is allowed for a small additional fee. NEW! 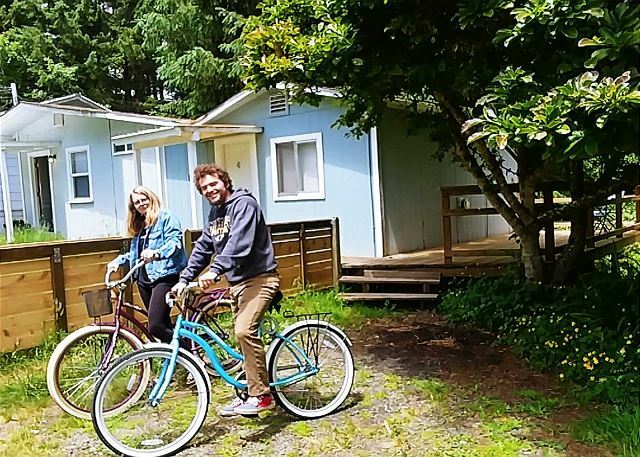 We now have shared BBQ and bikes available for guest use at our Strawberry Cabins! 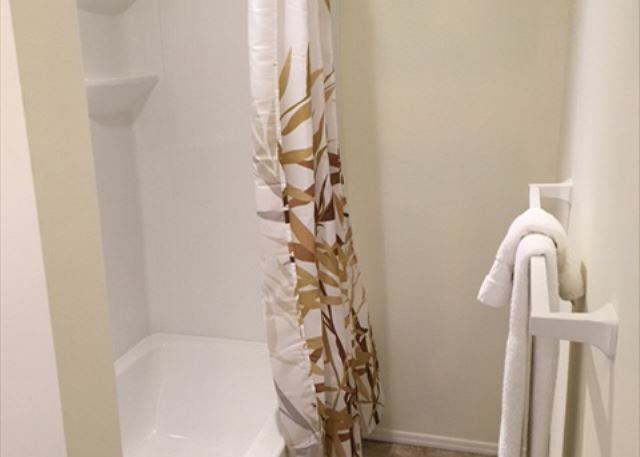 You will love staying at this suite, and this is a great central point for going to all of the beaches, lagoons, Redwoods National Park (just 25 minutes north). Trinidad is just 5 minutes north and downtown McKinleyville, with many great restaurants, stores, a movie theater, and a brewery is just 5 minutes south! And, you're just 5 minutes from the Arcata/Eureka Airport (code ACV) which is actually in McKinleyville. Humboldt State University and downtown Arcata around 15 minutes south and Eureka, with it's fun Old Town District, is just another ten minutes past Arcata. We really enjoy our stay there. The tavern isn't loud at all. We have stayed in two different suites. In #2 and #3. Both were great. It's super close to clam beach and we love that. Our dog loves that beach. I would for sure stay again. Cute little cabin in the woods . Dog friendly. Great location for us. Recently updated. Clean and quiet. Near Clam Beach Tavern but it was not an issue. Definitely would go back. Thanks for the review of the Strawberry Creek Retreat. glad you had a nice stay with us. Hope to see you again. Strawberry Creek Retreat was a great place to stay as a home base for checking out the redwoods. The unit was small but cozy and worked well for a couple. 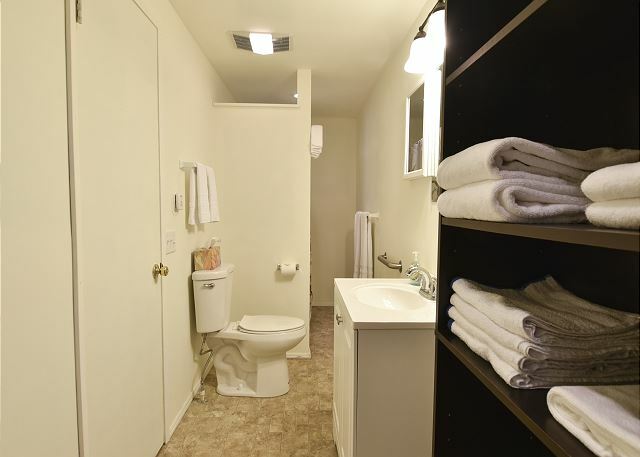 The kitchen and bathroom were clean and fully usable. WiFi was pleasantly speedy for those who like to stay connected. The location is indeed directly adjacent to a tavern. Light sleepers might have a little bit of trouble with that, although the tavern wasn't active too much past about 10-11 PM. The small size of the unit meant the fridge is right next to the bed, so again light sleepers might be affected. Overall the stay was great and it was a more than adequate spot for redwoods action for a couple of nights! Renting a place near a tavern can be fun or it can be a challenge, but it sounds as though you had a good stay while visiting redwoods. These units are cozy and finding the appropriate place to put things can be tough, like a fridge, but I do hope it helped having it there for its use. Thank you again for your stay and I hope you will return to stay in one of the other units in the future. We had a great stay. Everything we needed was there for us, the place was comfortable, clean and the people at the tavern were friendly. Would definitely stay again. Thanks for the great review and hope we can have the pleasure of your company at Strawberry again! I have stayed here before, so I am a repeat customer. I like Strawberry Creek because it is reclusive and quiet. It is my down time place for a very busy life. Having a Tavern next door is wonderful as I can have a cocktail or two and walk to my room. The regulars are friendly and happy. Thanks for the great review! The back deck is especially sweet overlooking the greenbelt along the creek. Most certainly looking forward to seeing you next year! Did you enjoy the bikes and ping pong we have available for guest? Flick a booger and hit it, but it was a great location(close to the Highway and beach) and the place was cozy, clean, and functional. Bed was a tad bit on the soft side(futon), but that’s a preference thing for us. Thanks for this review! Made me giggle. Yes, close to Tavern, but we don't hide that fact you are in close proximity. Hope we can host again! Did you enjoy ping pong or bikes that we have there? I stayed in two different units at this location and found them both to be very clean and cozy. The decks out back offer a relaxing back drop while the bar nextdoor was perfect for a night cap. The proximity to local surf spots is a huge plus. Thanks! The Strawberry Cabins are great for pit stops while surfing and other recrateing in our area. Hope we can see you again! We have two more for you to get acquainted with on the property. We absolutely loved the stay here. The room was clean and the view from the back porch was well worth it. Thanks you for the great revewi! We also have bikes to borrow for nearby local trails and a ping pong table to boot! Hope we can host again! The cabin was quite nice and cozy. Bed was comfortable and everything was well laid out. My biggest complaints were the directions to the cabin made no sense and the parking situation was not ideal. There is a tavern next door but it never got too loud or rowdy. Cabin is close to the beach and town. Overall I would stay here again. Thanks for the great review! I have re-read the directions and tidied them up. Hope it's much more clear next stay! 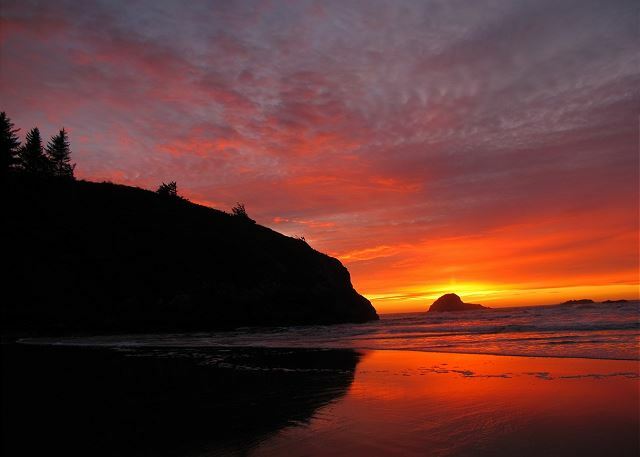 Thank you for choosing Redwood Coast Vacation Rentals. The cottage was much cuter than the pictures! It was newly painted, artwork was added, and rugs! Perfect size for two, full kitchen was a great bonus. The bed was super comfy. There was live music 2 of the nights at the neighborhood watering hole, that we could walk too! Loved the back deck. Thanks for the great review and hope we can host again! We have four cabins at this location. all with full kitchens and bath. The night life at the local watering hole has local bands and good times with local craft beers available. Plus it's a quick on to the 101 for your next Humboldt adventure! This cabin was very cute, clean and comfortable. It was just like the picture. When we arrived the fireplace/heater was running, the cabin was toasty warm and cozy. There was local coffee and yummy cookies left for us. The weather was stormy this weekend on the coast but it was ok we just holed up in this adorable little cabin! Thanks! We loved having you and see you next time with Redwood Coast Vacation Rentals! Perfect place to lay your head while traveling through the redwoods! We had a lovely stay and enjoyed the local tavern just steps from the front door. Would definitely recommend! The local coffee and delicious cookies were a wonderful touch as were the soaps in the bathroom. Thanks for the great review! Sounds like you had a nice time! Hope we can host again! Clean, right next to a bar (there are pros and cons to that but it was perfect for us! ), close to the highway. Thanks! It's a great spot! Strawberry Creek did an amazing job to make our experience the best it could be as we visited the Nothern Redwoods. I would recommend this retreat to anybody interested in visiting the area. Great job! Great review for Strawberry Creek Retreat! Thank you so much and we hope you will return to visit us again! This was a last minute trip to the coast, thought we would try AirB&B. This place was great! Just the basics, but clean comfortable and close to where we wanted to be for the night. This was my first Airbnb stay. For the price, it was acceptable. Knowing that there is a bar right next to the cabin ahead of time was beneficial; as I packed my earplugs! It was a great location to the beach and provided closer proximity to Redwood State and National Parks than staying further south. The room was recently remodeled and seemed that some more minor work was needed to be completed. All was very clean. Thank you for the review of the Strawberry Creek Retreat. 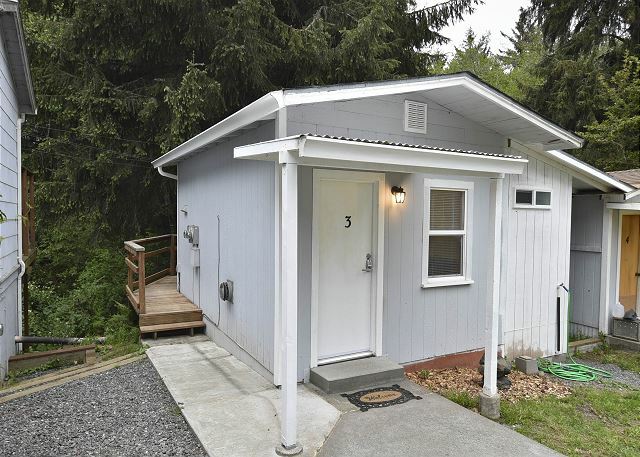 This cabin is definitely in a great location for exploring and being close to Redwood State and National Parks, and at very reasonable price. Thank you for being observant that it is next to a bar and being prepared. Your feedback was greatly appreciated. 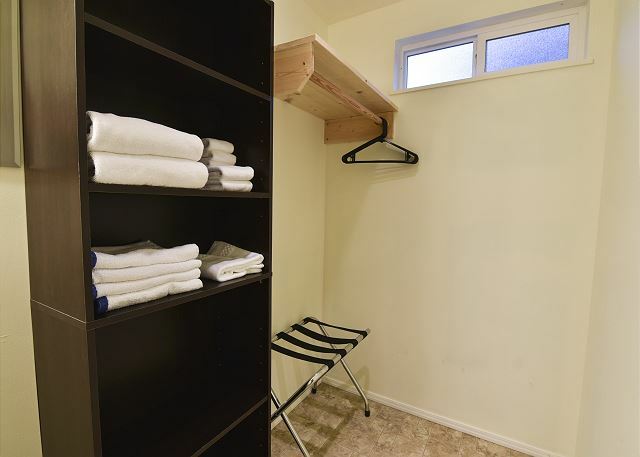 Yes, this unit was recently remodeled, and we are still working on some final touches in between guests as we can get in there. Thank you for staying with us and we do hope you will stay with us again on your nest trip to the north coast.